Lars220 1 day, 7 hours ago. This was yet another example of why third party security tools should be avoided in Windows 10. They offer little additional protection which Windows Defender and Windows itself do not offer. Anti-Rootkit is a particularly egregious example. This “additional protection” is very redundant with Windows built-in protections, and it adds nothing of additional benefit. Yet, this “protection” actually prevents critical system files from being updated, both on a monthly basis and when there is an attempt at a Feature Update. The problem is made worse because the monthly Cumulative Updates report in Windows Update History as being “successfully installed” when in fact they may have failed to change critical system files. Tools such as Belarc Advisor will show immediately that there is a problem, but the average home user will not know how to use such tools effectively. I hate to sound like a One Note Johnny, but I repeat — Windows Defender and the Windows 10 Firewall as of Version 1809 are all you need to protect Windows 10 and major web browsers. Third party security products and browser extensions are not only unnecessary, but they can actually interfere with updating your Windows system. In this sense, they can be harmful to your PC security. Thank you rc primak for the information and reminder about Belarc Advisor. I try to remember to use that utility / tool regularly, and did remember for the March 2019 updates. 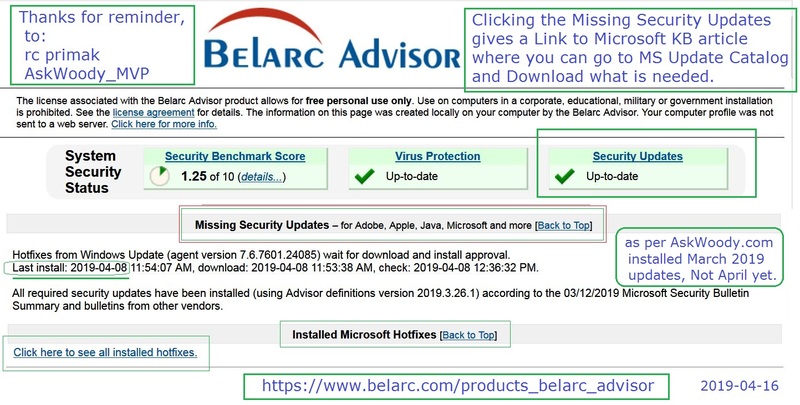 Tools such as Belarc Advisor will show immediately that there is a problem, but the average home user will not know how to use such tools effectively.